The past, present and future of the ever-morphing arts fest. 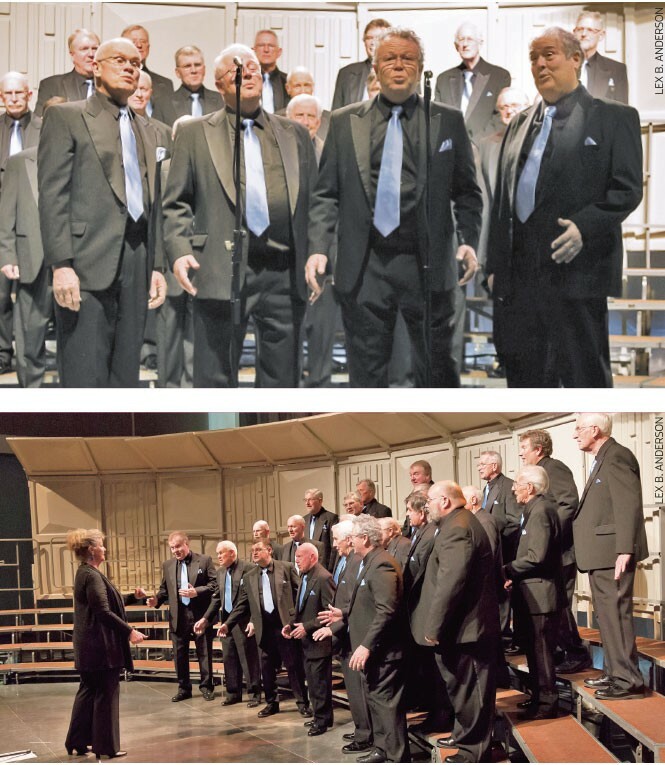 After nearly 70 years, the Beehive Statesmen Barbershop Chorus continues to seek harmony. This is an old group," says Doug Jones, president of the Beehive Statesmen Barbershop Chorus. Sitting in a South Salt Lake coffee shop, he and fellow member/marketing and public relations officer John Close look to Sharon Gardner, the Statesmen's former president and oldest living member (and Jones' great-uncle), to determine exactly how long the Statesmen have been harmonizing. Gardner, 79, recalls that he first sang with the Statesmen in 1959, 10 years after they chartered, but that they'd been performing since 1948. (Jones has nearly 21 years with the group. Close is approaching his second anniversary.) That's almost 70 years. "We had over 125 membership [at one time], and we put, consistently, for quite a number of years, 80-plus [members] on stage." He says that "hundreds" of Statesmen have come and gone over the years, "and more than a hundred have passed away." "Nowadays, we're a lot smaller," Jones says. "We only put 25 or so on stage." Within the chorus are smaller quartets (4th Street, SLiCk City, Gray Matters) that perform separately. A barbershop chorus is the same as a barbershop quartet, says Jones—"just more [of it]." A quartet sings four-part harmonies, with one person singing lead (the main melody), tenor (high line), bass (low end), and a baritone singing "whatever's left over—we call it the garbage part," jokes Jones, a lead. "Don't say that in the article," says Close, who along with Gardner, sings bass. The three men erupt into laughter. "Good baritones are hard to find, so you try not to insult them," Close says. "But I do it consistently," Jones protests. "Well, you're a jerk," Close teases. I tell them this sounds like the barbershop version of rock-band drummer jokes. "How do you know if the stage is level?" Close blurts out. "The drummer is drooling out of both sides of his mouth!" The trio cracks up. In all seriousness, Jones says, "Baritone is probably the hardest part to sing." Gardner seconds this: "No question." It's a utility role; a baritone must sing whatever notes—high or low—are needed to complete the chords that comprise that classic barbershop sound, which is a more technical form of a cappella. Jones quotes a cappella pioneer Deke Sharon: "A cappella is the martial arts of singing; barbershop singers are the black belts." To underscore Sharon's point, Gardner tells the story of the first year that Salt Lake City hosted the International Championships, and the then-champs from Dallas sang with the renowned Mormon Tabernacle Choir. "[MoTab] started to sing so that you could understand the words, after that. They're a pretty top-flight organization but, yeah, they went to school." The technicality is important, because the harmonies are why barbershop music gives chills to singers and listeners alike. "The sound is amazing when it's done right," Jones says. "You can tell when you're doin' it right, because it gives people goosebumps." Gardner recalls the words of a former Statesman, who liked to say that locking in the harmonies "makes your skin feel like a sack of BBs." We all hold up our arms to show gooseflesh and raised hairs prompted by simply talking about the music. What is it about barbershop, that mere discussion of it causes a physical reaction? Surely there is a scientific explanation, but none of us at the table know it. But they say people give off vibes, that we resonate with each other. Musical notes are vibrations. Locking in a harmony with someone, actively trying to resonate together, must achieve a deeply human connection. Gardner, Jones and Close say locking in the harmonies doesn't happen all the time. Some nights, it doesn't happen at all. But getting together in a room with a bunch of people who are content just trying to harmonize, and who share a tendency to lift their voices to test the acoustics of random foyers, hallways, stairwells and elevators, is magical. Ultimately, Jones says, "We just sing to sing." Mia Love, for all her lofty rhetoric, is but another of the swamp creatures who are thriving in Washington's murky depths.